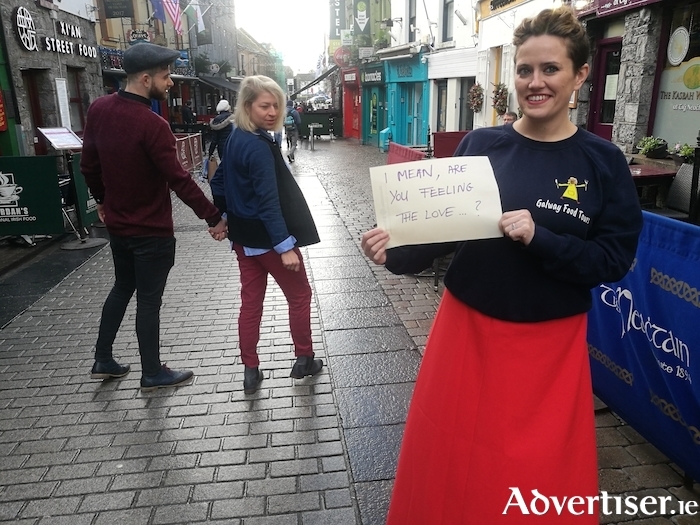 Advertiser.ie - I mean, Can you feel the love? The annual homage to love, Valentines Day and the inevitable “what are your plans? If you’re single, the options are between hiding away and going out on the town, in a long-term relationship, well then its how do we reinvent the wheel this year, in a new relationship… it’s time to impress and if you happen to be all of the above on Feb 14th, there is the answer for you in Galway. Galway Food Tours the culinary walking tour of Galway by Sheena Dignam and Gosia Letowska is answering all the above love dilemmas with a special valentines inspired food tour. Join Galway Food Tours on Wednesday 14th February for a fun food tour in Galway’s westend. “We will introduce our own take on Valentine's night for the foot loose, the in a relationship and those who are in between people of this town, who love to eat, drink and be social able. You never know what could happen as we stroll around these streets, “said cupid wannabe herself Sheena. The tour will take in Galway’s westend including the award winning Dela Restaurant, John Keoghs The Lockkeeper, on the Crust Bucket pizza bus and in Massimo Gastro Pub. “At each stop, the food tour is treated to a flavour of just what each place offers as well as a little tipple. Each location has a story to tell and this is the beauty of the tour, you get to experience the inside track on all these brilliant food and drinks haunts in Galway’s westend. As well as great food and drinks, we will be playing some Valentines games and the night will be all about just enjoying yourself,” explained Gosia.